Over 1 million users in 26 languages. Completely free and open source. OSX users: control-click the installer and choose Open from the popup menu rather than double-clicking. Physics teachers: Have you developed a good Tracker activity? Why not share it with the comPADRE Digital Library community? Click here to learn more. 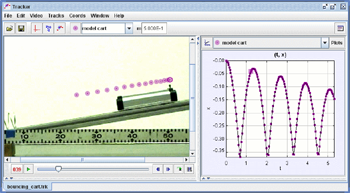 Tracker is a free video analysis and modeling tool built on the Open Source Physics (OSP) Java framework. It is designed to be used in physics education. Tracker video modeling is a powerful way to combine videos with computer modeling. For more information see Particle Model Help or AAPT Summer Meeting posters Video Modeling (2008) and Video Modeling with Tracker (2009). To install Tracker, download and run the appropriate installer using the links at the top of the page. Tracker includes a JRE runtime and Xuggle video engine. For help see Installer Help. Supported languages: english, arabic, czech, danish, german, greek, spanish, finnish, french, hungarian, indonesian, italian, hebrew, korean, malaysian, dutch, polish, portuguese, slovak, slovenian, swedish, thai, turkish, vietnamese, simplified chinese, traditional chinese. Interested in translating to another language? Please contact . If you're new to Tracker, see Help Getting Started for a step-by step beginner's guide or Getting Started with Tracker for a video tutorial. For general help, use and search the built-in help files in Tracker, the online help in English or Slovenščina, or the downloadable pdf help files in English, Español, Ελληνικά, Italiano or Portuguese. You can run Tracker from a USB drive without installing it on the host computer. See Installing Tracker on a USB or other portable drive for more information. Tracker has been independently tested by Softpedia and found to be 100% clean. External models animate and overlay multi-point data from separate modeling programs such as spreadsheets and Easy Java Simulations. Video filters, including brightness/contrast, strobe, ghost trails, and deinterlace filters. Data include units (SI metric units by default, settable length and mass units). Circle fitter tool fits circles to 3 or more points, steps or tracks. Display measured values using custom number formats if desired. Integrated searchable help and diagnostics. Annotate videos with colored line drawings and labels. These video tutorials can help extend your knowledge of Tracker. There are many more Tracker tutorials on YouTube--some are quite good. Tracker Quick Start A quick demonstration of how to use Tracker to measure the acceleration of a falling ball. If using Tracker for the first time, watch both this and Getting Started with Tracker. Getting Started with Tracker A more extended explanation of how to use Tracker to track and analyze a moving object in a video. Tracker Autotracker Tutorial How to use the autotracker. This starts out with the basics but also explains in detail how the autotracker works and how to control it for best results. Saving and Sharing Tracker Experiments How to (a) save Tracker experiments by exporting Tracker zip (TRZ) files and (b) share them by building Digital Library Collections. mechanics_videos.zip (7.3 MB) A collection of mechanics videos suitable for analysis and modeling. spectroscopy_videos.zip (0.6 MB) A collection of spectroscopy videos suitable for line profile analysis. Video Modeling with Tracker (pdf) (AAPT, Summer 2009 at Ann Arbor) Note: the accompanying jar file no longer runs with current Tracker installations; please see instead the Tracker Sampler collection in Tracker's Digital Library Browser. Tracker is free software; you can redistribute it and/or modify it under the terms of the GNU General Public License, Version 3. Tracker is distributed in the hope that it will be useful, but WITHOUT ANY WARRANTY; without even the implied warranty of MERCHANTABILITY or FITNESS FOR A PARTICULAR PURPOSE. See the GNU General Public License for more details.